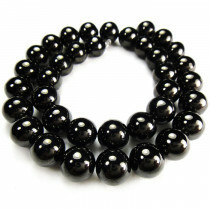 Jet Beads also known as "Black Amber Beads" or "Witch's Amber Beads". Jet is a glossy, lightweight and is warm to the touch. Jet is a geological material and is considered to be a minor gemstone. Jet is a product of high-pressure decomposition of wood from millions of years ago. Jet Round 4mm Gemstone Beads (~100pce Strand) - 40cm /16'" Strand. 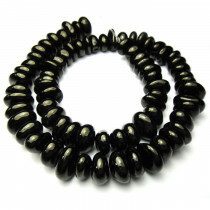 Jet Round 6mm Gemstone Beads (66pce Strand) - 40cm /16'" Strand. 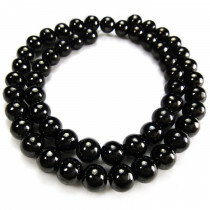 Jet Round 8mm Gemstone Beads (~50pce Strand) - 40cm /16'" Strand. 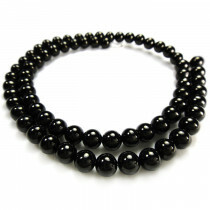 Jet Round 12mm Gemstone Beads (~33pce Strand) - 40cm /16'" Strand. 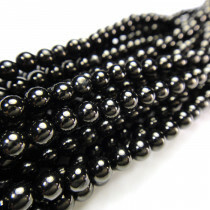 Jet Centre Drilled 4-8mm Nugget Gemstone Beads (~50pce Strand) - 40cm /16'" Strand. 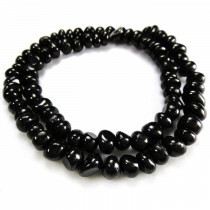 Jet Centre Drilled 6-10mm Nugget Gemstone Beads (~66pce Strand) - 40cm /16'" Strand.